Earn even more with GreenTrust Rewards through December 7, 2018. Every dollar spent on Qualifying Products Qualifying Products in October and November earns double points. Each dollar spent December 1 through December 7, 2018 earns one point. Plus, you can earn up to an additional 10,000 points through the Acelepryn® Brand Points Bonus. 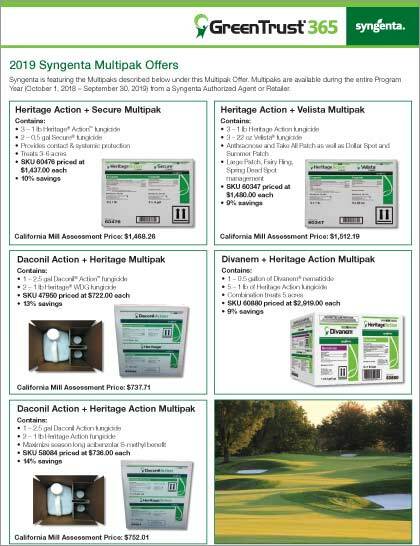 Buy at least 2 gallons of Acelepryn insecticide and you'll earn a one-time bonus of 10,000 GreenTrust Rewards points. You can use your points to redeem a wide range of rewards from industry and non-industry partners. All points expire on November 15, 2019. ©2018 Syngenta. Important: Always read and follow label instructions. Some products may not be registered for sale or use in all states or counties and/or may have state specific use requirements. Please check with your local extension service to ensure registration and proper use. Acelepryn®, Barricade®, GreenTrust®, SummerPay™ and the Syngenta logo are trademarks of a Syngenta Group Company. Amazon.com® is a trademark of Amazon.com, Inc. The Home Depot® is a trademark of Homer TLC, Inc. LOWE’S® is a trademark of LF, LLC. Staples® is a trademark of Staples, Inc. Starbucks® is a trademark of Starbucks Corporation. Visa® is a trademark of Visa.